Not Currently on our Shelf. "Twas the night before Easter, just before dawn, Not a creature was stirring out on the lawn. "The Easter bunny takes center stage in this delightful spin on Clement C. Moore's beloved poem that will send families hopping to the bookstore for an Easter treat sweeter than any sugar plum! Natasha Wing was born in Milford, Connecticut in 1960. At the age of 20 she moved to Arizona where she finished college at Arizona State University in 1982 with a B.S. in Advertising. In 1988 she married Daniel Wing and moved to Northern California where she worked in advertising for a number of years. It wasn't until 1991 that she decided to write children's books. Luckily she sold her first book, Hippity Hop, Frog on Top, within 6 months and has been writing children's books and articles ever since. Her second book, Jalapeno Bagels, came out in June 1996 with Atheneum Books. 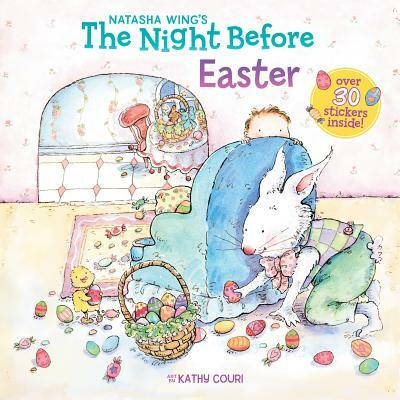 The Night Before Easter, was published with Putnam All Aboard Books. She has also been published in Humpty Dumpty's Magazine, Girls' Life, and Hopscotch for Girls, and has two recipes in Writers in the Kitchen. Birthday: February 7thPets: Siberian husky, Sabaka, and cat, JemimaProfessional: Member of Society of Children's Book Writers & IllustratorsFavorite Children's Books: Polar Express, Charlie and the Chocolate Factory, The Cat in the Hat, The Golden CompassFavorite Season: FallFavorite Tree: MapleFavorite Color: Cranberry redFavorite Cookie: Oatmeal Raisin with Vanilla ChipsReason for writing The Night Before Easter: "I wrote The Night Before Easter for parents to read at bedtime so children could go to sleep with sweet dreams of jelly beans dancing in their heads."